A blade is literally a self-contained server, which collectively fits into an enclosure with other blades. Sometimes known as a chassis, this enclosure provides the power, cooling, connectivity, and management to each blade. 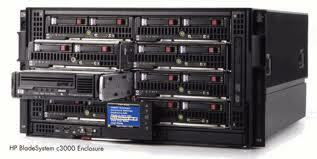 The blade servers themselves contain only the core processing elements, making them hot-swappable. HP refers to the entire package as a BladeSystem. # 648312-B21 HP 4X FDR IB Switch Switch – 34 ports – unmanaged.